Obtain the message status of an outgoing or incoming message. For information about installing Hermes and communicating with Hermes using an external application, please refer to Installing Hermes and Using Hermes API. The above figure shows a typical architecture for integrating client applications with Hermes servers. 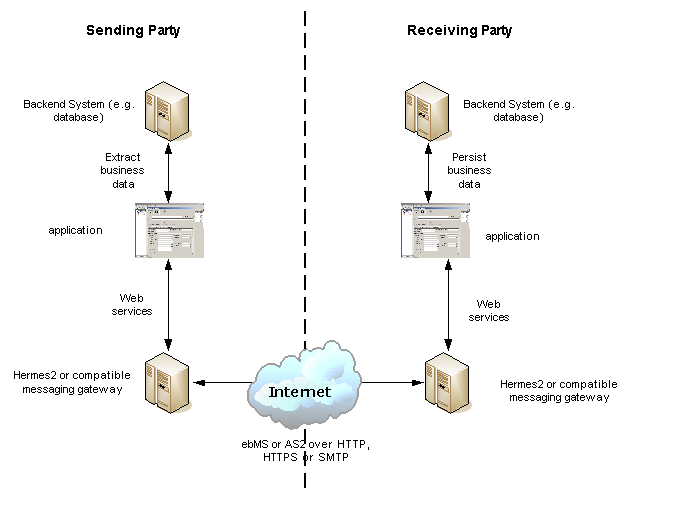 Two parties exchange business messages with Hermes through ebMS 2.0 or AS2 over a transport protocol, such as HTTP, HTTPS or SMTP. On the sender side, a backend system produces business data to be transferred to the receiver party. The sender application extracts the data from the backend system and submit them to Hermes through a web service. The sender’s Hermes sends the data as payloads in a business message. Then, the application invokes a web service to check whether the message is delivered successfully. On the receiver side, Hermes receives the message. The receiver application retrieves the message from Hermes, extracts the payloads from the message, and stores them into the receiver backend system. Implementation-independent. Since the application interacts with Hermes using web services, the application can be implemented in any programming languages, as long as web services are supported. Firewall-friendly. The web services provided by Hermes use HTTP as the transport protocol. The application calls Herms with web services over HTTP; this way, persistant and stateful connectivity between Hermes and the application is not required. Even when there is a firewall between Hermes and the application, the application can communicate with Hermes as long as HTTP connections between them are not blocked. The source code shown below comes the Hermes loopback test. The sample code assumes that Hermes is using localhost with port 8080 (i.e., the default port of Tomcat). We need to create a SOAP message with the following 10 paremeters and send it to Hermes as a web service request. Define a namespace URI and prefix conforming to the WSDL, and define the endpoint URL of the ebMS sender web service. Create a SOAP message factory and a SOAP message object. The method createElement creates a SOAP element with the namespace prefix nsPrefix`, the namespace URL nsURI, and the string value of the element. Attach a payload to the SOAP message if necessary. The example here uses a purchase order XML as the payload, so the associated content type is application/xml. Save the changes to the SOAP message. Send the SOAP request to Hermes and get the following SOAP response. Process the SOAP response, extract the identifier of the requested ebMS message, and print it to System.out if there is no SOAP fault. The method getFirstChild gets the first element with the name message_id and the namespace URI nsURI. An existing message_id is a registered identifier, showing the message has been successfully submitted to Hermes. Hermes translates the SOAP request is now transformed into an ebMS message and saves it in its persistent storage. Then, the sender Hermes delivers the ebMS message to the receiver Hermes, which is specified in the SOAP request parameters, of which cpaId, service and action identify the partnership between the sender and receiver. We need to create a SOAP message with the following 9 parameters and send it to Hermes as a web service request. Define a namespace URI and prefix conforming to the WSDL. Create a SOAP message factory and an SOAP message object. The method createElement creates a SOAP element with the namespace nsPrefix, the namespace URL and the string value of the element. Save changes to the SOAP message. Process the SOAP response, extract the identifier of each requested message, and print it to System.out if there is no SOAP fault. The method getFirstChild gets the first element with the name :code`messageIds` and namespace nsURI. It then extracts every messageId which represents an available message awaiting a further action. We need to create a SOAP message with the identifier of the target message and send it to Hermes as the web service request. Populate the SOAP body by filling in the required parameters. The method createElement creates a SOAP element with the namespace prefix nsPrefix, the namespace URL nsURI, and the string value of the element. Send the SOAP request to Hermes and get a SOAP response. The attachment is formatted as a MIME part. Process the SOAP response, and extract the payloads from the received ebMS message if available. // Do something I/O to extract the payload to physical file. The method getFirstChild gets the first element with the name hasMessage and the namespace URI nsURI. The boolean value of hasMessage represents the existence of a payload in this message. The payload is extracted from the attachment part, and written to the input stream. This way, the data can be piped to a processor or saved as a file. The method createElement creates a SOAP element with the namespace prefix nsPrefix, the namespace URL nsURI and the string value of the element. Process the SOAP response and extract the status information from the ebMS message if there is no SOAP fault. The method getFirstChild gets the first element with the name messageInfo and the namespace URI nsURI. It then retrieves the status value from that element. We need to create a SOAP message with the following 7 parameters and send it to Hermes as a web service request. The method createElement creates a SOAP element with the namespace nsPrefix, the namespace URL nsURI, and the string value of the element. Process the SOAP response and iterate through the message history if there is no SOAP fault. The method getElement gets the element with the name messageList and namespace URI :code`nsURI`. Then, a list of messageElement objects is extracted from messageList. Each messageElement object contains the values of messageId and messageBox. We need to create a SOAP message with the following from 3 parameters and send them to Hermes as a web service request. Define a namespace URI and a prefix conforming to the WSDL. Create a SOAP message factor and a SOAP message object. Attach a payload if necessary. The following example uses a purchase order XML as the payload of the AS2 message, so the associated content type is application/xml. Only one payload is allowed in the SOAP request for an AS2 message. Process the SOAP response and extract the identifier of the AS2 message, and print it to System.out if there is no SOAP fault. The method getFirstChild gets the first element with the name message_id and the namespace URI nsURI. The sender Hermes translates The SOAP request into an AS2 message stored in the file system, and then delivers the message to the receiver Hermes specified in the SOAP request parameters, of which AS2From and AS2To identify the partnership between the sender and the receiver. We need to create a SOAP message with the following 3 parameters. Process the SOAP response and extract the identifiers of the AS2 messages to System.out if there is no SOAP fault. The method getFirstChild gets the first element with the name messageIds and the namespace URI nsURI. All children with the name messageId and the namespace URI nsURI are then extracted. The method createElement creates a SOAP element with the namespace nsPrefix, the namespace URL nsURI and the string value of the element. Process the SOAP response and extract the payload from the AS2 message if available. The method getFirstChild gets the first element with the name hasMessage and namespace URI nsURI. The boolean value of hasMessage represents the existence of a payload in this message. The payload is extracted from the attachment part and sent to the input stream. The data can be piped to a processor or saved into a file. We need to create a SOAP message with the identifier of the target message and send it to Hermes as a web service request. The method createElement creates a SOAP element with the namespace prefix :code`nsPrefix`, the namespace URL nsURI and the string value of the element. Send the SOAP request to get the status of an AS2 message and get the following SOAP response. Process the SOAP response and extract the status of the AS2 message if there is no SOAP fault. The method getFirstChild gets the first element with the name MessageInfo and the namespace URI nsURI. We need to create a SOAP message with the following 5 parameters and send it to Hermes as the web service request. Define the namespace URI and a prefix conforming to the WSDL. Send the SOAP request to Hermes to get an AS2 message history and get a SOAP response. Here is the SOAP response. Process the SOAP response and iterate through the AS2 message history if there is no SOAP fault. The method getElement gets the element with the name messageList and the namespace URI nsURI. The messageElement objects are extracted from the messageList object. Each messageElement object contains the values of messageId and messageBox.